HAMMOND, Ind. (CNS) — Catholic culture is alive in working-class Hammond, specifically in the city’s downtown through an initiative to tell the history and share the beauty of the Romanesque Revival-style St. Joseph Church. The effort involves a guided art tour that highlights the tangible reminders of what generations of faithful Catholics have gifted to today’s parishioners. Parishioners and volunteers hope the tour, titled “Labor in Faith,” will become a regular Sunday feature sandwiched between the 9 a.m. Mass and the Tridentine Mass at 11 a.m. Early on, it has attracted longtime neighbors and first-time visitors. “This church is big enough to feel awe-inspiring when you walk in. That’s how I feel, but it’s not so large that it feels cavernous,” said Joan Crist, associate professor theology at Calumet College of St. Joseph and tour coordinator. A dozen people gathered in the right transept of St. Joseph Church on a recent Sunday. Unlike most Mass attendees who had left the building after the liturgy, others from East Chicago, Hammond and Munster stayed for the tour. Crist quickly began to build the story of the church from its forerunners to the features that make it one of northwest Indiana’s most distinctive and well-preserved worship spaces. Crist directed the visitors’ attention to the “intentionally modern” 1940s fresco above the apse of the sanctuary, which depicts the labors of constructing the church against the backdrop of the region’s gritty industrial landscape. Archbishop John F. Noll of South Bend, who died in 1956 at age 81, is depicted in the scene viewing a rendering of the church plans. Tour-goers learned the altar was created from four kinds of Italian marble and completed in 1914. But some guests continued to crane their necks to view the church’s 52 stained-glass windows. From Marian themes, to the Holy Trinity, to scenes of Jesus’ life and ministry, Crist said she could only point out a few details of the large rectangular windows on the walls of the nave and in a rose stained glass on the east side. 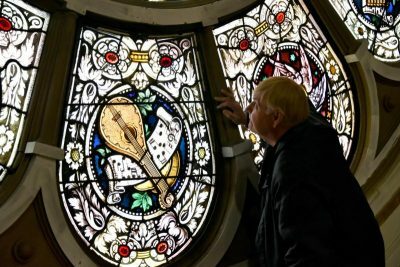 The parish is celebrating the 100th year anniversary of the commissioning of their “priceless” collection of stained glass, which was created in Munich. Crist said she wishes to share the beauty of St. Joseph Church while giving a nod to various ministries in the parish that have contributed to the downtown Hammond neighborhood. She explained that the parish has been a warm and inviting place where she and her husband have raised two boys and a girl. The tour ended in the choir loft, which features a rose window of St. Cecilia, patron saint of musicians. Parishioner Lindy Hernandez provided a reflection on the glass, describing the instruments and flowers that speak to the saint’s lore. She credited the beneficence of the Young Ladies Sodality, the then-sponsors of the window’s commission. The church has been a bedrock in downtown Hammond’s business corridor, which once boasted ornate theaters, men’s clothiers and discount retailers. Most businesses that drew large crowds are gone, though nearby Franciscan Health has expanded, and medical and legal offices, a federal courthouse, a grocery store and a few restaurants dot the corridor. 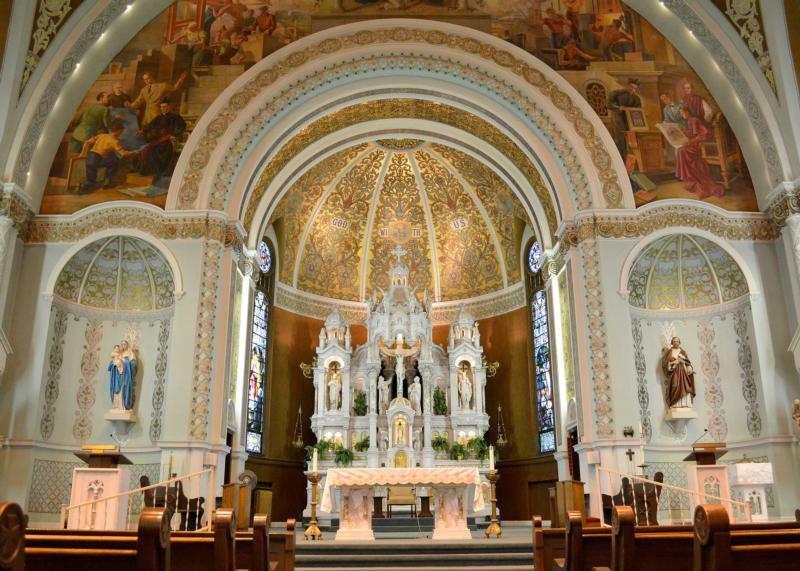 Parishioners who believe the strong economy could translate into a revitalization of downtown Hammond said the words painted in gold leaf on the apse of the sanctuary, “God with us,” give them optimism and a sense of place in the church. Others have expressed their affinity for the worship environment of St. Joseph: the traditional design and countless scriptural lessons told in frescos and stained glass create a sacred “embrace” and “homey” environment. Alonzo writes for the Northwest Indiana Catholic, newspaper of the Diocese of Gary.